Shi, Z., Zhang, Y., Liu, M., Hanoar, D., Gan, Y. (2018) Dynamic contact angle hysteresis in liquid bridges. Colloids and Surfaces A. 555:365-371. 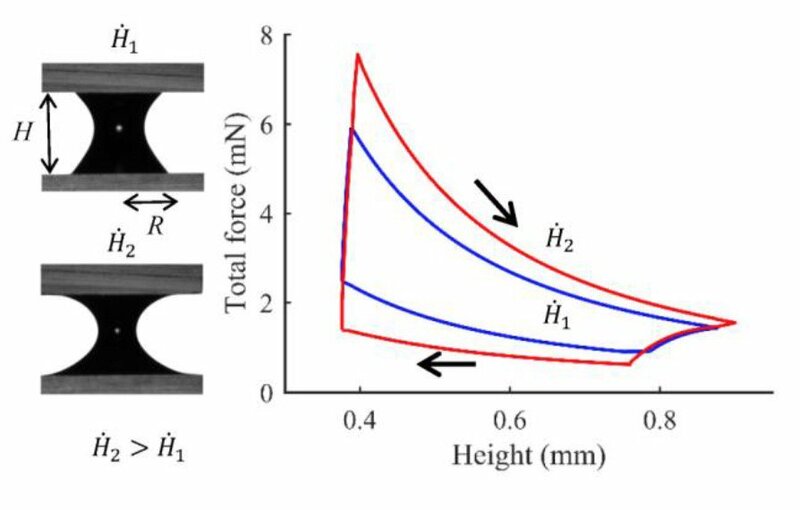 This work presents an experimental study of dynamic contact angle hysteresis using liquid bridges under cyclic compression and stretching between two identical plates. Under various loading rates, contact angle hystereses for three different liquids were measured by examination of advancing and receding liquid bridges, and the capillary forces were recorded. It is found that for a given liquid, the hysteretic behaviour of the contact angle is more pronounced at higher loading rates. By unifying the behaviour of the three liquids, power-law correlations were proposed to describe the relationship between the dynamic contact angle and the capillary number for advancing and receding cases. It is found that the exponents of obtained power-law correlations differ from those derived through earlier methods (e.g., capillary rise), due to the different kinematics of the contact line. The various hysteretic loops of capillary force in liquid bridges under varied cyclic loading rates were also observed, which can be captured quantitatively by the prediction of our developed model incorporating the dynamic contact angle hysteresis. These results illustrate the importance of varying contact line geometries during dynamic wetting and dewetting processes, and warrant an improved modelling approach for higher level phenomena involving these processes, e.g., multiphase flow in porous media and liquid transfer between surfaces with moving contact lines. This entry was posted in Publications and tagged contact angle, liquid bridge, publications, surface tension. Bookmark the permalink. Post a comment or leave a trackback: Trackback URL.